CALL TOLL FREE 866.317.9642 FOR DIRECTIONS TO THE VENUE. THE HEALTHY AND STRONG ELECTRONIC DANCE MUSIC UNDERGROUND IS THE RESULT OF THE GRIT, DEDICATION, PERSISTENCE, AND PLUR OF EDM FANATICS SUCH AS YOURSELF. DIVE DEEP UNDERGROUND AND CELEBRATE THE SOUND OF LIFE THAT ONLY ELECTRONIC DANCE MUSIC CAN PROVIDE, AND JOIN US AT THIS EDM SOIREE AND AMERICAN CANCER SOCIETY BENEFIT AS WE RAVESTRONG FOR THE CURE. EVERY DOLLAR OF RAVESTRONG COVER CHARGE IS CONTRIBUTED TO THE AMERICAN CANCER SOCIETY; THAT ALL THE MUSIC, PRODUCTION, PROMOTION, EXPENSES, AND SPIRIT OF THE UNDERGROUND ARE GROOVIN 100% FOR THE CURE... PLUR. CONNECT THE DAY OF RAVESTRONG toll free 00 + 1 + 866.317.YOGA $5 before 9PM / $10 After / 18 + Must Have Valid I.D. Dayton, OH // Break On Thru / Give Us A Break! MASSIVE Respect to KIKWEAR Clothing as the BACK IN ACTION TOUR lands at RAVESTRONG! 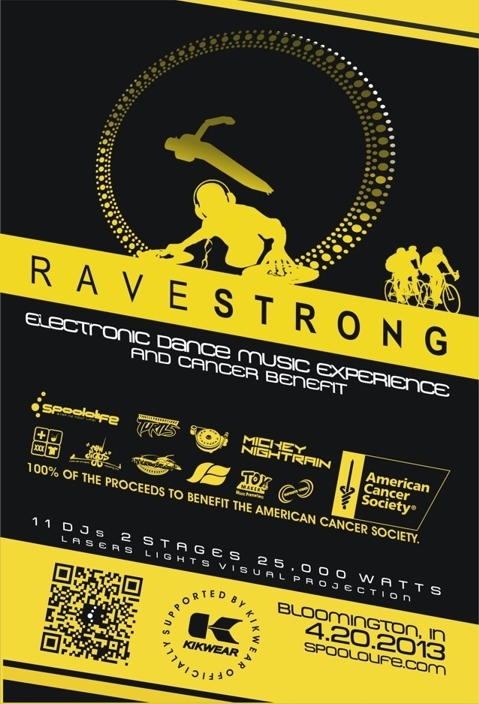 RAVESTRONG is also supported by STIMLINE VARIETY and NEWDIGGS. Show your support with your RAVESTRONG shirt, JUST $15 plus $5 shipping. Un expected error, please continue! Discover the magic of Spoololife! What's next Spoololife event near you? Massive respect to our sponsors! Get involved with our EDM network!